Two weeks ago, the company I work for flew my coworkers and I to Denver for a big false-enthusiasm motivational work meeting. When I got my flight information, the first thing I looked at was my departure time. (7 A.M. by the way. Yuck) The second thing I noticed is which airline we were flying on. Frontier? What the heck is Frontier!? I immediately assumed that my place of employment was cutting corners and getting us to Denver by way of pony express. It turns out that Frontier is a legitimate airline after all. They may not be in every airport across the nation but are in quite a few. They only fly between North and Central America. My biggest worry about flying on Frontier is that I would be riding in those toaster ovens that Delta's little sister Skywest uses occasionally. Thankfully they are normal sized planes and don't give you shaken baby syndrome every time you fly through a cloud. I am a tall guy(6'2" when standing with good posture, 5'11" normally) and most airplanes are not built for freaks like me. Or maybe it's the fact that the "big and tall" such as myself are not meant to ride coach. Frontier did give me the option when i checked in to upgrade to a seat with more leg room. I was so close to making the upgrade but knew that my company would come after me for the charges. The flight was under an hour so it was bearable, but if I were flying for over 2 hours the leg room bump would be worth trading in my David Robinson rookie card for. I don't know if this applies to Frontier airlines as a whole, but in the 2 flights I was on there was no First Class. The only good seats were the extra leg room seats. Though not being a first class rider, maybe that's a good thing. Everytime I have to pass the first class rows to find my coach seat I feel like the violated girl taking the walk of shame down a frat house hallway. One of the reasons I use Southwest airlines more than any other is they don't charge for checked luggage. That reason alone probably brings them more business than anything. Frontier, as with most others, charges around 20 bucks a bag. Because my employer skimped on the airline they definitely weren't going to reimburse me for a checked bag. This might be a big money-maker for airlines but I believe it's driving the stewardesses(take that political correctness) crazy. So no one checks luggage in anymore and they cram as much as they possibly can into 2 carry on suitcases that can fit small children. On both flights I was on, half the plane was boarded but the overhead storage bins were all used up. The stewardess had to inform everyone else that they were going to throw their bags with the rest of the cargo. They could cut out that whole process if they just stopped charging for luggage. This has nothing to do with Frontier's services but my company placed me in the middle seats round trip. I understand that someone has to draw the short straw and take one for the team every once in a while, but putting a long-legged lurp like me in the middle seat is inhumane. My own private Alcatraz. The flight, like I said, was incredibly short so the snack service was limited. They served a round of drinks and also gave us a slightly warmed cookie. Looking at their snack cart I could not fathom what made it so warm. I surmised it was the heavy-set man (Kevin Smith?) in front of me who was sitting on them to melt the chocolate chips. That didn't stop me from eating it. As far as in-flight entertainment goes, there were tiny screens on the back of every seat. Though the only options for viewing were a handful of cable tv channels. And if you wanted to watch something thrilling like MSNBC it would cost you a cool $6. No thanks. Yes, once again, if I were flying cross country I would pay extra for the extra leg room and for TV, but 6 bucks seems a bit steep for an hour flight. Though I'm sure if you're flying with kids it might be a necessary evil. Everything else on the plane was standard. The seats were just as comfortable/uncomfortable as any other airline. My flight wasn't delayed so that's good news. They say that they're less expensive than any other competitor. After price checking a few flights on different airlines, there wasn't any big price difference. 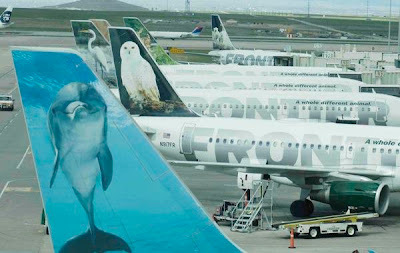 The Frontier airlines slogan claims they are "A whole different animal." The way they really drive this home is by putting animals on the tail of the plane. 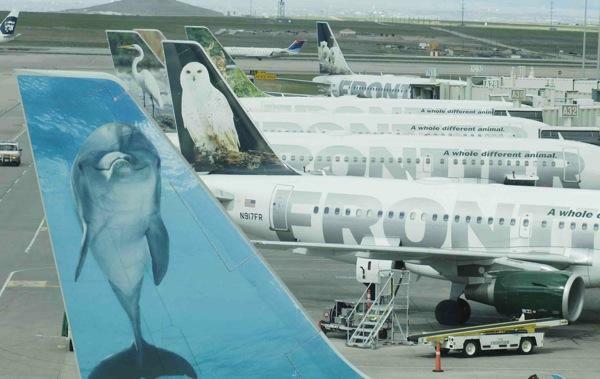 That's cute but it doesn't necessarily drive me to pick their airline because it reminds me of Sea World. I have ragged on Frontier Airlines but to tell you the truth they overcame my expectations by actually being a safe, standard airline with no glaring differences from bigger airlines. Frontier airlines reaches for the stars but only get 3 from me.